The idea for a community garden for Toronto was sown at the first Toronto Area Sustainable Neighbourhood workshop in November 2010. People were keen but needed land. Initially the plan was to start the garden in Carey Bay, but the process to get the land and the garden up and running, for various reasons was quite slow. In the mean time the Toronto Senior Citizens, were also discussing the possibility of making a community garden in their grounds to help revitalise the group with the joys of gardening, people to get involved and help the elderly folk. A chat over coffee was the catalyst for bringing these two groups together when both groups discovered they could help each other! 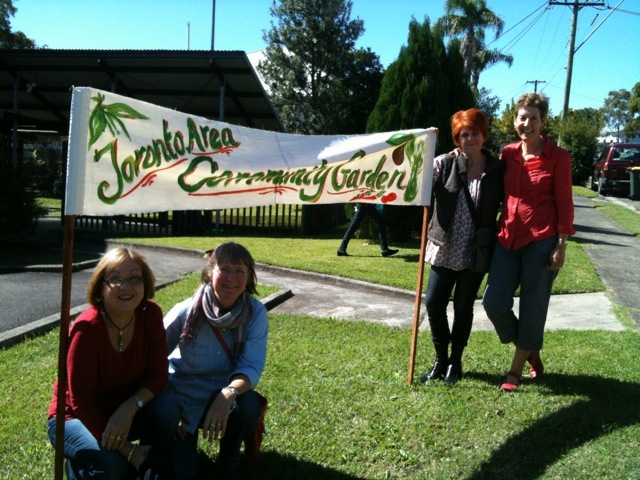 With people keen to get gardening it was decided to start at the Senior Citizen’s Hall site, while the application for land at Carey Bay site was written and land became available. The idea took root and began to grow. After gaining agreement from the committee, we organised a planning day with Liza Pezzano from Permaculture Hunter and a diverse group of people of all ages and backgrounds turned up. We dreamt up some big ideas (like structural changes to help with things like water harvesting and composting), then after some good advice agreed to start small and let the garden grow gradually. The first initiative was to get things growing. The Senior Citizens provided funds for soil for garden beds and the first working days were a combination of physical work and meeting times. We built a very long, narrow bed around the edge of the car park. We've learned some lessons along the way. Most people don’t like meetings! Most people are only interested in gardening. One never knows how many people will turn up. We learnt to make the gardening a priority. We learnt that not everyone sees eye to eye. We always have enough people turning up to do some work and chat. We are also developing a philosophy. We want everyone to be able to have a say and know they will be listened to. We want every one to be appreciated for however much or little they can contribute. We value the various ways individuals can contribute and the different qualities they bring to the group. We welcome and value people of all ages and abilities and from all walks of life. We want the garden to be organic. We want to share our produce and value Earth’s resources and the wonders of nature. And the plants just keep on growing! The physical fruits of our labour are the miraculous produce coming from the garden. It is wonderful to behold! 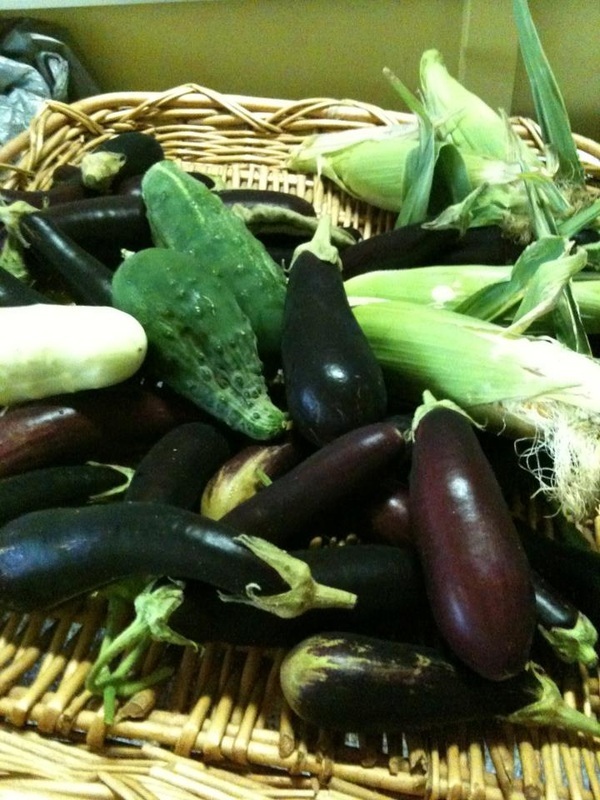 Masses of delicious eggplant, cucumber, sweet corn and parsley. This lifts our spirits, delights our palates, and is proving to be a good source of income. The ladies from the yoga class are buying any excess veggies for a donation and the amount raised will be great for buying seedlings for the next growing season! The other fruit of our labour is the wonderful links developing in our community, and between the different groups who use the hall – yoga participants, U3A, Tai Chi, Chi Gong, our new knitting group, the gardeners, and the Senior Citizens group. 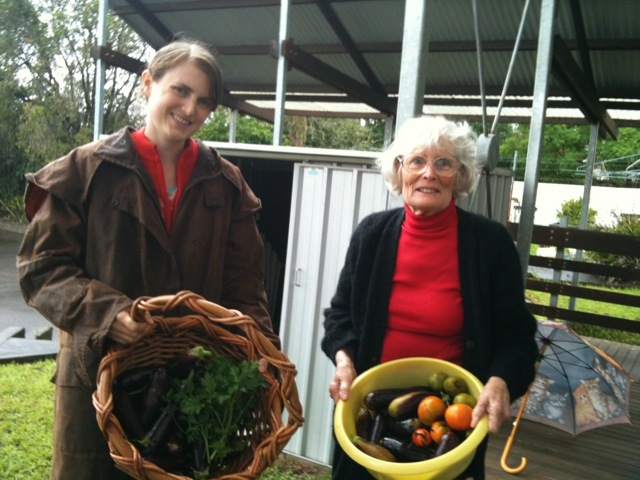 Volunteers from the garden group have offered to help cook for the Seniors group on a weekly roster. We’ve started with sandwiches but we are looking at ways of making yummy meals from the garden veggies. This is just the tip of the iceberg. In spite of some difficulties getting our garden going in its early stages, we have started this year with a very encouraging, healthy, developing group! With the help of many people who use the Centenary Hall in different ways, and their on going good will and support, we held a garage sale and raised over $400. A real community effort! We were also given a generous $1000 grant by the Toronto Tidy Towns Committee. We are currently working on building compost bays out of recycled wooden pallets and we are planning to make an earth bag retaining wall to level an area for more garden beds to be ready for spring. This will be a workshop for us to build the wall and for others to learn how to do it. The garden is now open two days a week - Tuesday and Thursday mornings, and is located at The Centenary Hall, 97 The Boulevarde, Toronto. Monthly meetings are on the first Saturday of every month at 1.30pm. For information about the Senior Citizen’s group phone 0431 958 717. Find out about other projects of the Toronto Area Sustainable Neighbourhood Group.